The “Stilo” range – design Jessica Engelhard – satisfies the exact requirements when it comes to ergonomics, modern styling, ease of operation and optimum value for money. The “Stilo” office swivel chair, is ideal for workstations used by a number of different people.For example in call centres or with desk sharing. The user can, depending on the specific requirements and their personal workplace situation, choose the appropriate mechanism using the building-block principle. The height-adjustable “Stilo smart work” with see-saw mechanism always cuts a fine figure with its delicate appearance in a home office and at temporary workstations. Using the Syncro-Quickshift basic technology, users can quickly and conveniently adjust the backrest counterpressure to their own individual needs. By contrast, the Syncro-Smart-Automatic mechanism automatically adjusts to the user’s body weight. 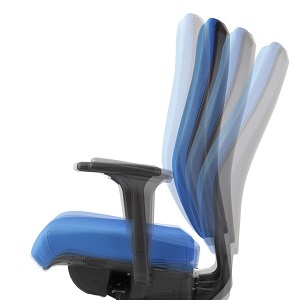 The Syncro-Activ-Balance mechanism with automatic Balance function ensures the correct seat tilt at all times – particularly in the case of a predominantly forward-leaning working posture. With the 3D-Balance mechanism, the seat surface and backrest follow the user’s movements in all working positions, forwards , backwards and to the sides. The “Dauphin Stilo operator” model recently received the renowned AGR “Tested & recommended” seal of quality. Developed as an important decision-making aid for consumers, the AGR certificate is only awarded to products that have demonstrated their back-supporting design in front of an independent testing board made up of experts from different medical fields. 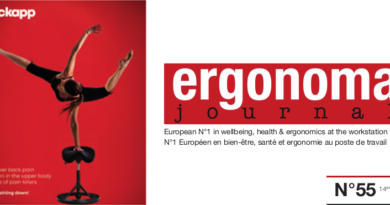 ← Exclusive, to be read only in Ergonoma Journal N°53.